Westchester Medical Center members cheer their ratification announcement on January 4, 2017. This hospital is our second home and we are family! Our bond and perseverance allowed us to fight strong and ultimately achieve a great contract! We look forward to recruiting nurses and welcoming them into our ‘home’ and continuing to make Westchester Medical Center a great place to be not only for us but most importantly for the patients and families.” These are the words of Damayanthy Sujanthan, RN, a neo-natal ICU nurse and one of 1,500 NYSNA members who celebrated a contract ratification on January 4. Westchester Medical Center (WMC), located in Valhalla, NY, is a public hospital that serves communities in seven counties….seven! Few hospitals in the nation can make such a claim or shoulder that responsibility. 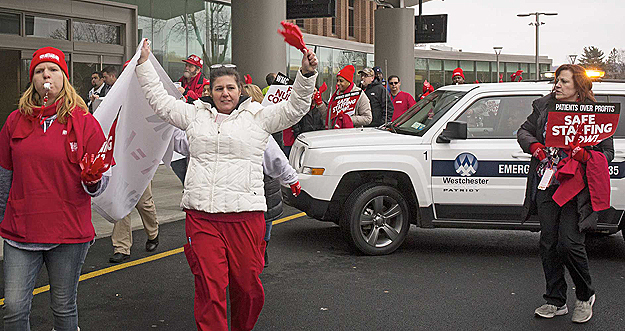 The WMC nurses have worked long and hard to achieve a fair contract — to keep quality care in place for the thousands of patients who come through its doors, all the while advocating strongly for a fair deal. The new contract strengthens their ranks with provisions that better define agency nurses and protect vacation time. The WMC nurses are now among the highest paid RNs in the nation. [See highlights at bottom of article] With the new deal in place, recruitment and retention rates will go up. All the nurses agree: this was key to protecting quality care. The RN fight at WMC goes back a number of years. A critical juncture came at the end of 2012, after WMC management announced they were reducing RN FTEs. Jayne Cammisa, RN, NYSNA board member for the Lower Hudson/NJ Region and fulltime release time rep at WMC, has spent close to 30 years at the facility, including in the kidney-liver transplant unit. She recalled vividly the nurses’ decision to launch a POA campaign to express concerns that reduction of RNs could negatively affect working conditions. 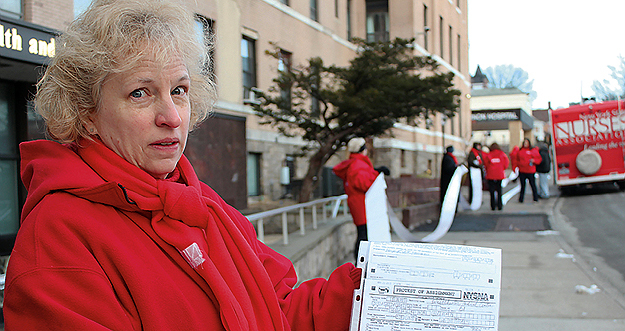 POA — Protest of Assisgnment — is a NYSNA form that nurses have used to achieve better staffing. The nurses filed thousands of POAs reflecting staffing issues and concern for the future of the hospital. “We launched an extensive POA campaign,” said Ms. Cammisa. “And it was very effective.” Over time, the hospital returned nurses to the ranks. “Now we have more than 1,200 FTEs and about 250 per diems,” she said. Other issues endured, however. Wages were not keeping pace. The senior nursing staff became concerned that RNs could be lured away by competitive hospitals. Unified and determined, the nurses closed ranks. They successfully fought to bring nurses back after the December 2012 layoff and staffing improved. ensuing staffing problems, in late 2012. The nurses kept going, honing their demands and sustaining their ranks. The outlines of a fair contract were considered and reviewed, debated and reconsidered, and outreaches to the community and to elected officials were on-going. The nurses appeared on billboards, dotted communities with lawn signs, and spoke out in local cable television spots. “Solidarity in our ranks was strong. So was the support of other unions and elected officials,” said Ms. Cammisa. WMC nurses, other NYSNA member support, the presence of other unions, community advocates and elected officials combined to bring the matter to a head on December 7, 2016. That day saw an outpouring of hundreds outside the WMC campus, linking arms, chanting and voicing demands. The demonstration was a powerful reminder of the unrelenting determination of the nurses and their supporters. 2016: On Dec. 7, NYSNA WMC nurses carried their message to the main entrance to ensure that it was seen by the hospital’s administration. WMC nurses were joined that day by NYSNA members from hospitals in the Bronx, Manhattan, Staten Island, Poughkeepsie, Long Island and as far away as Shore Medical Center in Southern New Jersey. Communication workers, teachers, fire fighters, CIR doctors, and 1199SEIU members were there, too. All came in solidarity and in recognition of the significance of the WMC to the hundreds of communities it served across the region. Present: State Senator Terrence Murphy, Assemblywoman Shelley Mayor, Westchester County legislators David Tubiolo, Alfreda Williams, and Kenneth Jenkins, and Yonkers City Councilman Michael Sabatino. Each offered firm commitments to stand with WMC nurses until a fair contract was reached. be here long after I’m gone—just like those who came before me have done for me,” said Jack Mace, RN and Grievance Co-Chair at WMC. Within days negotiations resumed and the teams met in focused sessions. A temporary agreement was reached late on Monday, December 12. Informational sessions were held over the Christmas holiday, voting on January 3 and 4, and ratification — by an overwhelming majority — was announced the evening of January 4. It was a major victory. 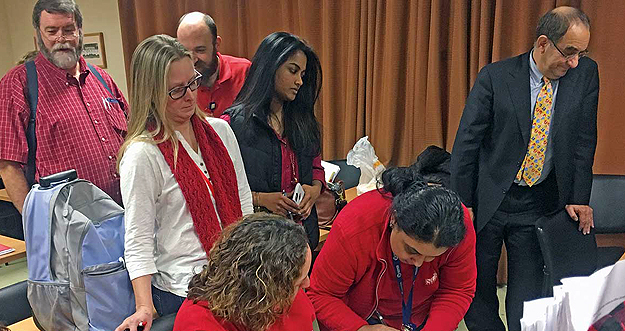 Roshan Cherian, an RN with more than a decade at WMC in behavioral health, said the contract provides an “excellent wage.” She is the only source of health coverage for her family, so the agreement on benefits was critical to her. But she reiterated what many WMC nurses have said: the fundamental effect of wages under the new contract will be on recruitment and retention. “I expect the outflow of RNs to stop with this new contract,” she said. That’s critical, all agree. “We can provide the highest level of care to our patients, many of whom are among the sickest in the nation,” said Wilma Wynter, RN, a member of the nurses’ negotiating committee and 23-year WMC veteran. 2016: NYSNA negotiating committee members signed the Memorandum of Agreement on December 20. The total value of the contract is $165 million over 6 years.